Health services have been restored at the remote Kantobo community in Southern Highlands after three years with the arrival of a nursing officer to work at the health facility. The facility, which serves a population of about 1,400 people, has been without a health worker since the last one left three years ago. 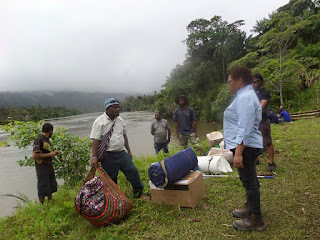 Since then, the only health services provided to the community were receivedfrom the monthly health patrols initiated by Oil Search Foundation (OSF) supported by partners from Southern Highlands Provincial Health Authority (SH PHA). The nearest health facilities are at Moro, which is 70km away while the Pimaga Rural Hospital is about 150km or an average of 3 days by foot. Given the poor road conditions and minimal government services in the area, the community was ecstatic when nursing officer Paul Penda, from Pangia, showed up in a dugout canoe on the bank of the Muvi River, accompanied by village youths. “Kantobo is very isolated and our people have missed out on vital health services for a long time – some have even died from snake bites and preventable diseases. So you can imagine our joy now that we have someone right here in the clinic who will provide health services to us,” said the Kantobo village health chairman, Abram Siyaihai. “Due to our isolation, a lot of people do not like coming here, but we will look after you and support your work at the clinic,” he told Mr Penda. Mr Siyaihai was on hand with OSF representatives and the community to welcome Mr Penda and help him settle in. OSF will repatriate his family to Kantobo at a later date. To show its appreciation to the SHPHA and OSF for bringing the nursing officer to Kantobo, the community cleaned the health facility, the nurse’s house and built a kitchen to help him settle in. OSF program supervisor, Apa Parunga, said the Foundation will continue to work with its partners to help restore and strengthen health services in Kantobo. “It’s good to see the newly-established Southern Highlands PHA responding with a sense of urgency to the cries of the people and finding someone who is willing to go to Kantobo despite its remoteness,” Ms Parunga said. SHPHA Chief Executive, Dr. Joseph Birisi said they would work in partnership with OSF to ensure that the heath facility and staff house are maintained to serve the communities. “We want to see that there is ongoing support with rural health patrols, logistical support for medical supplies is provided, proper reports are compiled, vaccines distributed along with helping to facilitate training and mentoring for the clinic staff. This also includes transport assistance for our health worker,” he said.